Ben Esposito's journey from cultural appropriation to fried-dough appreciation. From 2002 to 2014, Dunkin' Donuts didn't exist in Los Angeles. Hell, during that time there was just one Dunkin' store in all of California, at a military base on the state's southern tip. Considering there were more than 7,000 Dunkin' Donuts outposts littering the United States by 2013, the dead zone was an anomaly. In fact, it was one of the first things independent game developer Ben Esposito noticed when he made the move from New York to LA. "That was a big deal to me," he said. As a native New Yorker, he grew up on chain doughnut shops, especially Dunkin', which is headquartered in Massachusetts. On the opposite coast, however, he was dropped into a new world: Mom-and-pop doughnut shops flooded the Los Angeles marketplace, each offering its own spin on the classic fried delicacy. If America ran on Dunkin', California was a thousand different countries. "I was fascinated by that, and I was fascinated by the local doughnut culture," Esposito said. "Because the interesting thing about doughnuts in LA is that each shop is a fusion of a different culture and, you know, the standard doughnut shop. So you'll be able to get doughnuts and Chinese food or doughnuts and Mexican food, and they're all kind of mashed up and very local and specific to the community." Today, there are dozens of Dunkin' Donuts stores across California, sitting alongside community-run shops. Esposito calls this trend doughnut gentrification. "They're going to crush the local doughnut shops, because no one can compete with the scale of Dunkin' Donuts," he remembers thinking as the first Dunkin' opened in LA. "Even I have brand loyalty to them, which is stupid to say." Esposito's obsession with Los Angeles doughnut culture sparked the idea for his latest game, Donut County, a pastel, raccoon-infused puzzle game where players control a hole that grows every time it swallows a new object. It's heading to PC, iOS and PlayStation 4 next year, published by Annapurna Interactive. Esposito is an established game designer best known for his work on The Unfinished Swan and What Remains of Edith Finch, and he's a founder of Glitch City LA, a successful incubator for local developers. Games to come out of Glitch City include high-profile indie hits Hyper Light Drifter, Dream Daddy, Quadrilateral Cowboy and Frog Fractions 2. Esposito is in love with LA. It shows in his dedication to Glitch City and in Donut County itself. However, his latest game started life as something far removed from fried dough, the West Coast or anything truly meaningful in Esposito's personal life. Donut County used to be a game called Kachina. Esposito debuted Kachina at IndieCade in 2012, and by 2013 it had picked up some buzz and secured financial support from Indie Fund. Kachina's premise will sound familiar: Players controlled a hole in the ground as it swept under various objects, growing with each new ingestion. 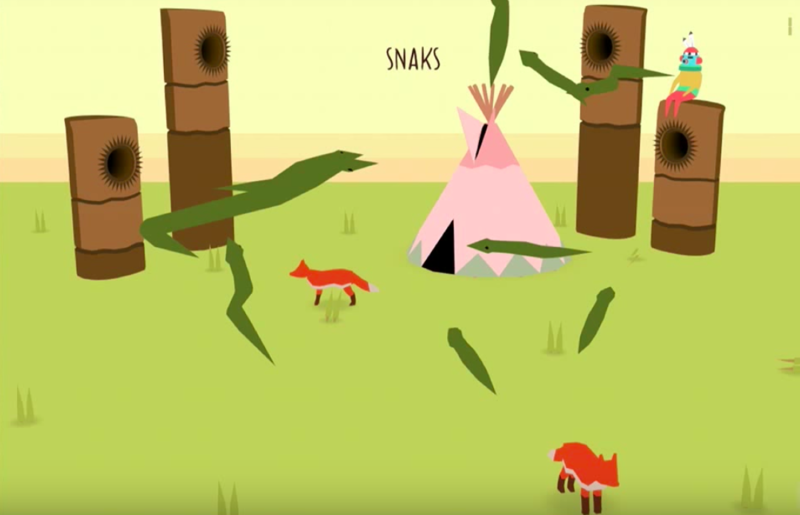 However, the game's design was vastly different than Donut County's: It featured art and objects that Esposito said were inspired by Hopi culture, including items like totem poles and teepees. However, totem poles and teepees have nothing to do with Hopi culture. What's more, Esposito talked about drawing inspiration from Hopi "folklore," a dismissive term for the deeply held religious traditions of indigenous people. 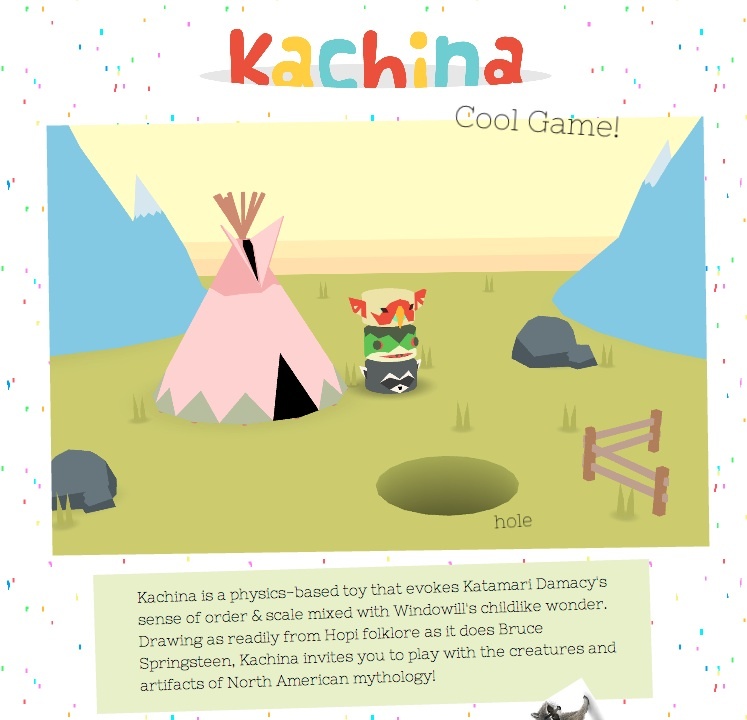 After Kachina's IndieCade debut in 2012, Debbie Reese of the American Indians in Children's Literature (AICL) blog wrote about the game's missteps and tweeted the story to Esposito. He read the article and decided to prove Reese wrong. Though Esposito knew little about the Hopi people -- he simply liked the look of kachina dolls -- he stuck with his game's premise and started researching, planning to eventually present an authentic and enlightening vision of the tribe to a new audience. His plan quickly went off the rails in strange and offensive ways. At one point, Esposito added a mechanic where players would burn down reservations to build tract housing. It was clear no amount of research would be able to save Kachina from itself; this was not his story to tell. By 2014, Esposito was officially woke. "I learned this really important and now very obvious lesson, which is, it doesn't pay to tell someone else's story," Esposito said. "In many different ways -- it hurts them and it hurts you, because it's not a genuine story." Nowadays, this train of thought is common in conversations with developers. The video game industry has changed dramatically since 2012; there's a growing social awareness throughout the production process, spurred by advocacy groups and the accessibility of communication apps like Twitter. However, just five years ago, cultural appropriation was a new idea for many developers. "I think people are tuned into the cultural implications of the media they consume a lot more now, probably thanks to stuff like Feminist Frequency doing the big, foundational work of showing people, 'Hey, you should think about it.' Which is, unfortunately, controversial," Esposito said. This bubble before online callout culture enabled Esposito to explore the root of his issues with Kachina. Even after the AICL blog post, he wasn't inundated with furious messages or attached to any incendiary hashtags. He was able to research, reach his own conclusions about cultural appropriation and then pivot when he realized he was wrong. In the end, he said it was a no-brainer. "It's really painful, and it costs a lot of time and energy, but I have to do it," Esposito said. "And I felt totally safe doing that. I didn't feel under attack or anything." This process helped Esposito realize another truth about game development: Make what you know. He couldn't build a heartfelt game about Hopi culture because he didn't have any connection to the subject matter. He needed to draw from the things he was actually passionate about. "I knew the game was about a place and the people who live there," Esposito said. "So I had to make the game about LA. Because I love LA, I'm fascinated by it. I think about it all the time. And I've put down some serious roots here." That brings us back to Glitch City and Donut County. Esposito and friends founded Glitch City in 2013 as a hub for LA artists and game developers to gather, create things and support one another. A space like this doesn't simply appear and stay open on its own -- it takes organization, dedication and financing for these collaboration spots to function. More local game-development hubs are popping up around the country, though others are shutting down. Look at the Philly Game Forge for just one example of a popular space having to close its doors. "If anyone's like me, they didn't really know what they were doing when they started it," Esposito said. "It costs a lot to do, it takes a lot of time and energy, it takes a lot of planning. It takes a lot of readjusting your priorities to make it work." But Esposito, Hyper Light Drifter creator Alex Preston and a handful of local LA developers have been making Glitch City work for the past four years. Aside from cultivating a string of successful indie games, the hub has been a source of emotional support for Esposito. He's no longer trapped at home, working alone on new projects and obsessing over irrelevant details or wasting time online. "Having the support of a lot of other people who are trying to do the same thing, who kind of understand that we're not really in competition with one another, we're here to support one another -- that's been just so valuable to me," Esposito said. "I don't think I would still be doing it if not for this community. I think I might have just given up." Plus, there's a local doughnut shop next to Glitch City that Esposito frequents. He makes sure to emphasize this fact: He may love Dunkin' Donuts, but he loves LA more and he wants to support the people who live there, whether they're making games or frying dough. Donut County is an attempt to share the magic of the city with a wider audience, and it does so in an adorable package filled with pink frosting and anthropomorphized animals. While Donut County's main mechanic involves a hole that grows as it consumes the environment, the game itself is actually story driven. "That's kind of central to it," he said. "It's short, and it's got absolutely no filler in it." (A fitting description for a game about doughnuts). Esposito took a winding path to Donut County, starting from a place of distance and ignorance and ending up surrounded by friends and sweet treats in LA. Despite the awkwardness of his original approach to Donut County, his game is better for the journey. He now trusts himself to build the things he knows, to tell his own story -- and the story of LA. "This is the most me game in the world," Esposito said. "And you're going to have to prepare yourself, because it's a very concentrated dose."